USA TODAY Bestselling Author - The AGATHA AWARD-WINNING Liz Talbot Mysteries "Has everything you could want in a traditional mystery: a credible and savvy protagonist, a meaty mystery, and setting that will make you want to spend time in South Carolina. I enjoyed every minute of it." - Charlaine Harris, New York Times Bestselling Author of Day Shift "This brilliantly executed and well-defined mystery left me mesmerized by all things Southern in one fell swoop. Boasting a superb cast of characters, engaging conversations, a feel good atmosphere and all-around entertaining whodunit, this is the best book yet in this wonderfully charming series." - Dru's Book Musings "This third in the series continues to smoothly combine elements of the paranormal and romance with a strong investigative plot that delves into the deeply hidden secrets of families...The charming setting, strong writing, and extremely engaging characters that have become hallmarks of this series never cease to entertain." - Kings River Life Magazine "Lovely writing with well-developed characters, a believable plot and plenty of interesting detail...Boyer may be unstoppable in conjuring mystery as she travels the social circles and back roads of the fascinating southern landscape." - Speakers International Where is Kent Heyward? The twenty-three-year-old heiress from one of Charleston's oldest families vanished a month ago. When her father hires private investigator Liz Talbot, Liz suspects the most difficult part of her job will be convincing the patriarch his daughter tired of his overbearing nature and left town. That's what the Charleston Police Department believes. But behind the garden walls South of Broad, family secrets pop up like weeds in the azaleas. The neighbors recollect violent arguments between Kent and her parents. Eccentric twin uncles and a gaggle of cousins covet the family fortune. And the lingering spirit of a Civil-War-era debutante may know something if Colleen, Liz's dead best friend, can get her to talk. Liz juggles her case, the partner she's in love with, and the family she adores. But the closer she gets to what has become of Kent, the closer Liz dances to her own grave. Related subjects include: women sleuths, private investigators, cozy mysteries, murder mysteries, book club recommendations, Southern fiction, Southern humor, Southern living. 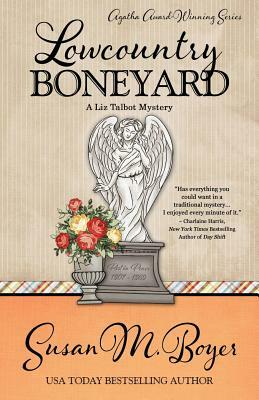 Books in the Liz Talbot Mystery Series: LOWCOUNTRY BOIL (#1) LOWCOUNTRY BOMBSHELL (#2) LOWCOUNTRY BONEYARD (#3) LOWCOUNTRY BORDELLO (#4) November 2015 Part of the Henery Press Mystery Series Collection, if you like one, you'll probably like them all... Author Bio: Susan M. Boyer loves three things best: her family, books, and beaches. She's grateful to have been blessed with a vivid imagination, allowing her to write her own books centered around family, beaches, and solving puzzles wherein someone is murdered. Susan lives in Greenville, SC, and runs away to the coast as often as she can. Her debut novel, Lowcountry Boil, won the Agatha Award for Best First Novel, the Daphne du Maurier Award for Excellence in Mystery/Suspense, and was an RWA Golden Heart(R) finalist. Susan's short fiction has appeared in moonShine Review, Spinetingler Magazine, and Relief Journal among others. Visit Susan at www.susanmboyerbooks.com.